I can't keep our secret any longer. We are having a little boy. I always thought we would have a little girl and I am still trying to get my head around the news. 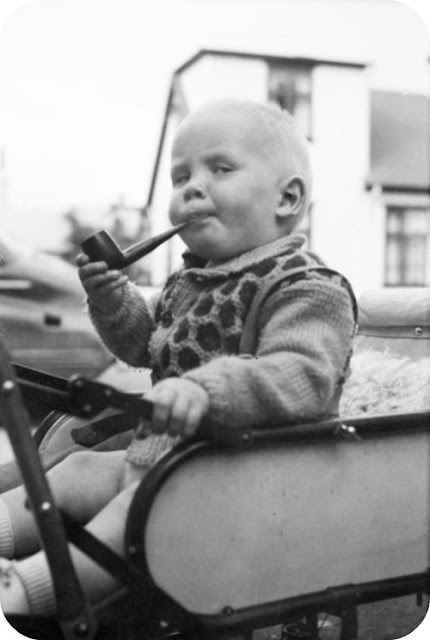 I've decided that he will be the most dapper little man around (minus the pipe). The hunt for cute little man clothing is on. I know, I know. I always wanted a little girl, too. I love girls! I wanted to gently shepherd a girl into womanhood, be a totally fun understand mom who could talk about FEELINGS...all that. But boys are truly special. I had a ton of mamas pull me aside and say, oh boys. They love their mamas. Boys are great! And they really are. I like that I can have fun picking out cute boy outfits but there's no pressure, like there is for little girls in the South. I don't have to keep up with hair bows or leggings or ballet slippers. Don't worry. You are going to have SO MUCH FUN with a boy. I wouldn't trade my own for a thousand little girls. Now I want a house with three little boys...all boys...all the time! I am so excited for you! I thought you were having a boy. I guess I just think about how great you have been with Devon and I picture you with your own little man. Now I can go shopping for you. I have just been waiting to hear. You and Dan are going to be amazing parents! When I found out I told Dan, "I hope he is just like Baby Devon". I am in the same place as you Kitty. My scan in is exactly 3 hours and I am so nervous and emotional. If our baby is a boy I'm going to struggle with how I feel. My friends who are Mamas of boys sing their praises just like your first commenter has done. It's just a scary prospect for the eldest sister of 3 wild boys and the sister in law of a very, very wild grown up boy. I understand the anxiety you may be feeling I've been putting myself through it for the past 5 months! My wait will hopefully be over in a few short hours and I you will be one of the ones I come to tell! Congratulations! I too really wanted a little dolly, I mean girl, to sew clothes for and dress. I have two boys and they are great. They are simple, girls can be hard work - all the emotions! Their needs are immediate! They are hungry now! They force you to learn stuff you never would have bothered with before. And my boys had the cutest fully lined tweed plaid pants and home made cashmere jumpers you have ever seen! I have 3 boys, and I adore each one. Now, I won't lie and say I did not want a girl. During the ultrasound for the 3rd baby, the nurse said do you want to know? Of course we said yes! She said, its a boy. One tear came down my cheeks that I would not have a girl. And that was that. I adore my boys. And quite frankly, when I see some of my friends with their little divas, I am pleased that I have all boys. Boys adore their Mamas, too. You know I am here if you need any advice in the "boy" department. Much love lady. XOXO CONGRATS! Oh! I am so excited for you. A world full of wonder and adventure awaits you as a mother of a boy. I will admit that I have mourned a little for not having a girl over the years. How fun that would be! But I have hopes for lovely daughters-in-law and granddaughters one day. And I have come to realize that despite my weaknesses and faults, Heavenly Father sent these four boys to me because I am the best mother for them. Just like you and Dan are the perfect parents for this little man. i agree with diana's comment. Sweet Kitty, this is most wonderful news! you'll have the special blessing of raising your precious baby boy to be a Southern Gentleman (minus the pipe!). I love you for your honesty and your heart. There's so many cute little boy things... think bow ties and ties :) a little Dan. Congratulations to the most wonderful news!!! Congratulations!! May I suggest just a couple of our favorite little boy books? If I Built a Car by Chris Van Dusen is delightfully retro and Little Blue Truck by Alice Schertle has wonderful illustrations and a great little story. Children's books are the best! snips and snails and puppy dog tails! i'm just so over the moon happy and excited for you and dan. he will be the most dapper little man ever. you will be ready for this. i promise! sending you all my hugs and love. Congratulations!!! I wanted a little boy more than anything. Like someone else said, a boy will grow up and care for you. I love little boys. We found out we are having a girl and I wasn't crushed, but I feel like you do about having a boy. I don't know if I can raise a little girl. You are going to be a great mom to a wonderful little man, who will adore you. YAY!! A mini Dan. Just you wait! You get to raise that little scamp to be the perfect little gentleman. He's going to be adorable and your little pal. You'll love him more than anything! Maybe we can exchange advice because raising my Coco is seriously frightening. The other day she asked if she can have black high heel shoes when she gets a little older and yesterday she asked me to take her to Target or Costco to buy her a pink dress (I expected her to ask for a toy or something). I think boy or girl, you will be a great parent and Dan is a perfect person to raise a boy to a man. He will be very loved and very stylish, no doubt. I am so happy and excited for you! You know how I feel - you just had the best thing happen to you EVER. Boys are the best! I love what Rena said - it's so true! Dandelion bouquets, bugs and kisses await you! One very important word of advice from a boy mama: Don't change a diaper without shielding his private parts with a wipe, or you will get it in the face. No one ever told me that and I learned it the hard way. Even Jack didn't know that. I guess he doesn't remember being a baby. First night in the hospital Jack was changing Max's diaper and he peed all the way across the room and onto Jack's pillow and blanket! ps--Most boys are wild and crazy when they are young, but around 12 or 13 you're glad you don't have a dramaticious young lady on your hands. Preteen girls are scary! This is so great :) ! Congratulations. Boys are beautiful. More beautiful than you can imagine. He will teach you a lot and make you laugh! I miss my boy!